Going away to college. It’s all at once a rite of passage, a turning point and the culmination of years of hard work and dedication. For students whose paths lead them to Notre Dame, it’s also the beginning of an extraordinary journey filled with learning, discovery, faith and friendship. Like generations of Domers before her, incoming freshman Emmie Mediate of Colorado Springs, Colo., was drawn not only to Notre Dame’s academics, but also to the way students here weave service into the fabric of their everyday lives. While Emmie says she loved her high school experience, she’s looking forward to her new independence and the opportunity to meet people from different backgrounds. For her parents, the send-off is bittersweet, but there’s comfort in knowing she’s headed to a familiar place. When Emmie arrives on campus, she will be part of an incoming class that boasts some impressive statistics. Entering freshmen and their parents get their first taste of what it means to be a member of the Notre Dame family during Freshman Orientation, held over a late August weekend each year. Leave your pets (o.k., non-carnivorous fish are welcome, but make sure the tank is no larger than 30 gallons), air conditioners and water beds at home. Check with your roommate before bringing televisions, stereos, carpet/area rugs or furniture. Don’t forget laundry detergent and fabric softener. Once they arrive—with or without fish tanks—students spend three days getting acclimated, making friends, and learning about campus life, which, at Notre Dame, goes far beyond textbooks, classrooms and social events. 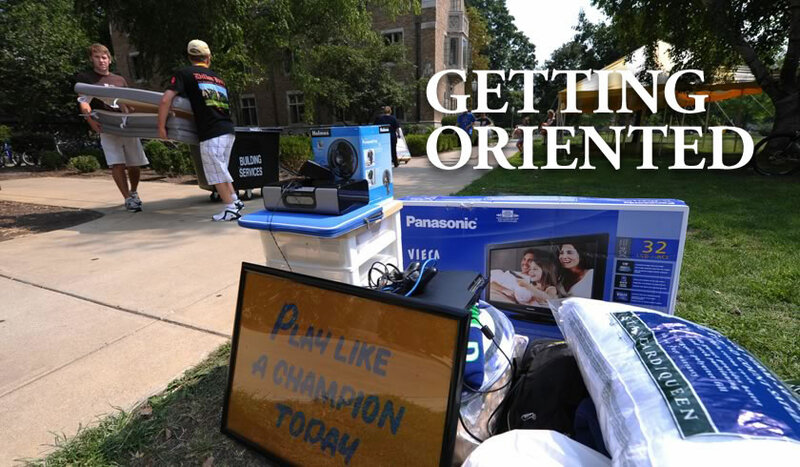 The Freshman Orientation weekend schedule starts with unpacking, then packs in a ton of events over the course of three memorable days. Here are some highlights. For freshmen, Notre Dame offers an innovative First Year of Studies (FYS) curriculum, designed to spark students’ imaginations as they navigate the many opportunities available to them. Rather than declaring majors, all first-year students enter FYS, where they benefit from a wide range of services and programs designed to help them not only ultimately choose a field of study, but also build a foundation for the “journey of exploration and discovery” that will take them through their college years and their entire lifetimes, according to Hugh Page, dean of the First Year of Studies. Part of that guidance involves helping students to develop the breadth and depth of their interests and to strike a balance amidst the dizzying array of programs and activities they’ll find on campus. Core to the program’s mission is academic advising, which pairs students with one of more than a dozen full-time FYS faculty advisors for assistance with choosing courses, building schedules and setting academic goals. FYS also gives first-year students access to their own Learning Resource Center, where they can sign up for collaborative learning groups or one-on-one tutoring, and the expertise of a University librarian dedicated specifically to them. Opportunities also are available for some students to get an early start through FYS initiatives such as the Balfour-Hesburgh Scholars Program and Summer Bridge. 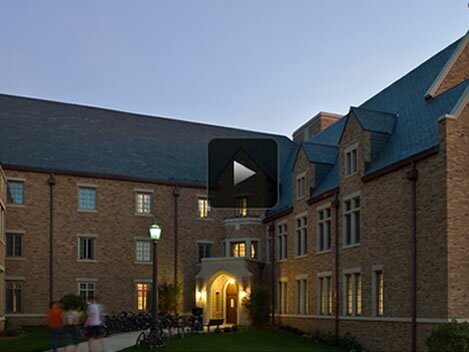 Beyond these high-quality academic resources, FYS also provides some unique opportunities for students to build relationships with Notre Dame faculty. 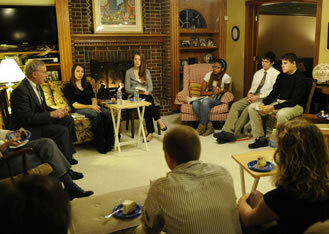 The programs known collectively as ND Ignite offer cultural and intellectual experiences to first-year students in settings both on- and off-campus, including, perhaps most notably, invitations into the homes of their professors. There are no fraternities or sororities here. 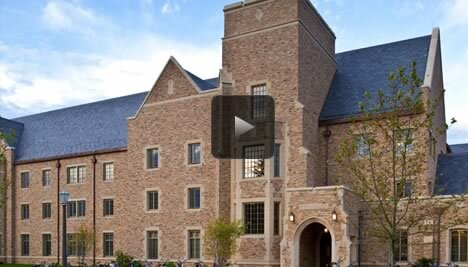 Instead, Notre Dame’s 29 single-gender residence halls offer a unique and cherished living experience. 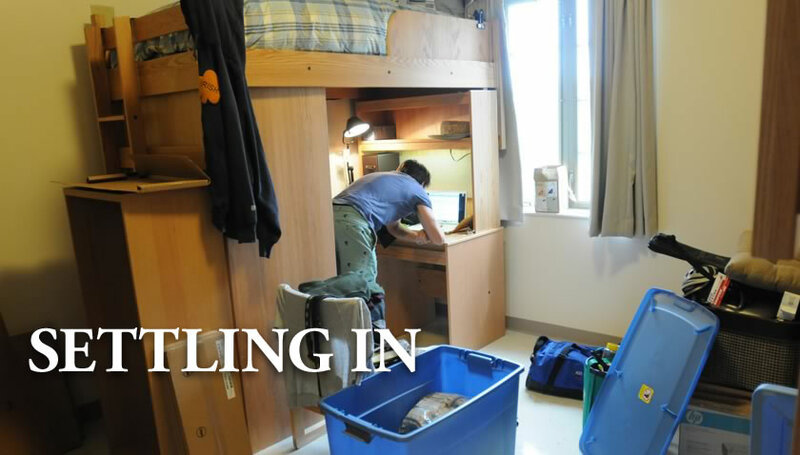 Eighty percent of undergraduate students live on-campus, and hall pride runs deep with a robust offering of special events, intramural sports and annual traditions – some for everyone, and others, like the Polar Plunge (sponsored by Badin and Dillon Halls), that are geared toward a select, adventurous few. In addition to the many social activities, every hall also engages in community service and leads a signature campus event. With a chapel in every hall, retreats, Bible studies and Masses are easy to find. Campus Ministry ensures that students of all faiths can find services in the South Bend community, as well as transportation to their respective churches, temples, synagogues and mosques. For those who are coming to campus for the first time as graduate students, the University also offers a welcoming and supportive community, one flush with opportunities for cultural and scholarly pursuits. Dedicated graduate student housing, a health plan, and support for those with families also are available. 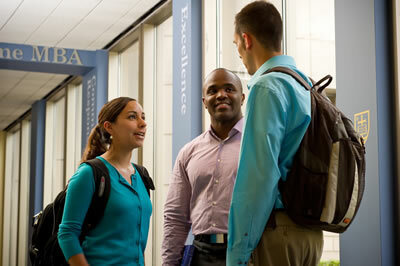 Whether enrolled in the Graduate School, Mendoza College of Business, Notre Dame Law School, or School of Architecture, graduate students become part of a vibrant, tight-knit learning community where they can work both independently and in collaboration with peers to reach their maximum potential. “At Notre Dame, we are addressed as future leaders and given all the possible tools to bring good to society,” says Alicja Kryczalo, a recent MBA graduate. In addition to a domestic student population that represents all 50 states, graduate and undergraduate students also come to Notre Dame from more than 100 countries around the world. For these newcomers to campus, International Student Services and Activities provides orientation and assistance to help ensure a smooth transition and a welcoming environment. Notre Dame has one of the highest percentages of student participation in study abroad programs of any American research university. 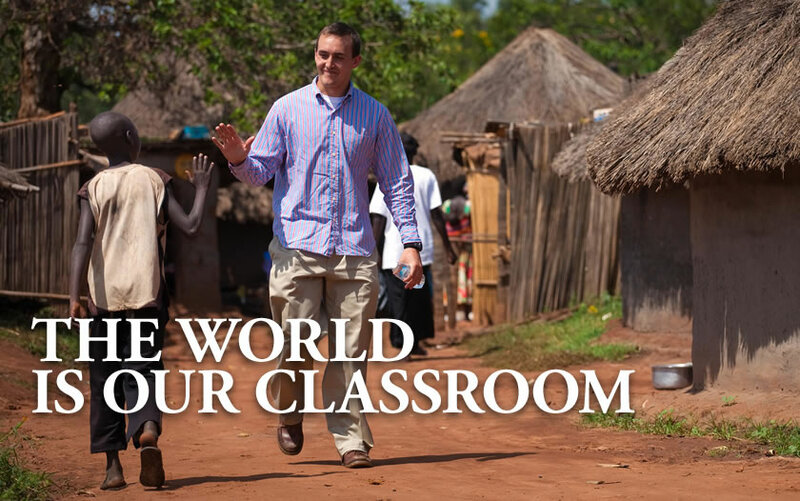 The Office of International Studies administers more than 40 programs in 20 countries that expose students to different cultures, languages and perceptions about the world, as well as provide a deeper understanding of their potential to become leaders in a global society. Through initiatives such as the International Summer Service Learning Program (ISSLP) of the Center for Social Concerns, participants gain international service-learning experiences in social concerns inspired by Gospel values and Catholic social teachings. 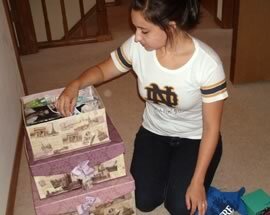 It doesn’t take long for new students to find their place in the Notre Dame community. Whether they’re incoming freshmen, transfers or graduate students from the U.S. or abroad, the inclusive and vibrant atmosphere on campus is hard to resist. That’s great news for newcomers like Emmie Mediate, but something of a mixed bag for her mom.